The Oris Robi Comb detects and kills head lice without chemicals. It is safe, effective and easy-to-use. If you have children or work in close contact with others, you will known what a pain head lice can be. They spread quickly, even with the most minimal of contact, and if treatment has been successful, re-infestation is always a worry. Chemical insecticides have traditionally been used to eradicate these pesky critters, but over time lice develop an immunity to these treatments. No-one likes putting overpowering chemicals on their loved ones, so a chemical-free alternative like the Oris Robi Comb Pro is a good choice. 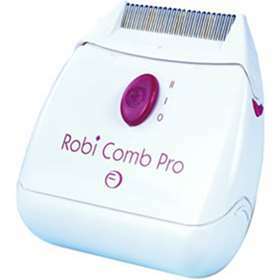 Use of ROBI COMB PRO does not harm humans and may be used safely at any age. Please note: Not suitable for Epilepsy sufferers. In order to benefit from optimal efficiency of this appliance, please conform strictly to the following instructions. 1. Insert an AA 1.5 Volt battery in the battery-housing. Use of alkaline batteries is recommended. 2. This appliance suits any hair type. 3. Perform the treatment on clean, dry and oil-free hair only. 4. Before the treatment, comb the hair thoroughly with a regular comb to free all knots. 5. Using the switch, operate the appliance in one of the two modes. The buzzing sound confirms that it is operating properly. 6. Hold the ROBI COMB PRO at a 45 degree angle and start combing with the comb teeth near the hair-roots and the switch pointing upwards. In mode 1 (identification), the appliance buzzes until it identifies and destroys a louse: at this point the buzz stops. Clean the comb with the cleaning brush. As soon as the combing unit is cleaned, the buzz recurs and you may continue. In this mode, you can quickly and easily identify the presence of lice. In mode 2 (elimination), the appliance buzzes and destroys lice. After destroying the first louse, the buzzing tone changes while lice elimination continues. When the power supply runs out, the buzz stops. At this point, clean the combing unit thoroughly, using the cleaning brush (Figure 4). The buzz will return only when the unit is completely clean and free of lice, dandruff or any other dirt. 7. In the event that the buzzing tone does not return, remove the comb housing by pressing the push buttons on each side of the appliance. Remove the combing unit from the housing and clean it thoroughly, using the cleaning brush. You may moisten the brush with alcohol (medical alcohol only). Once clean, dry the combing unit and brush thoroughly before re-use. A hair dryer can be used to reduce drying time. 8. The ROBI COMB PRO is highly effective in eliminating adult lice. Therefore, we recommend repeating treatments at least every day or two, for two weeks. This way you eliminate small young lice, which escaped previous treatments, before they reach maturity and lay new eggs. 9. Every time your child complains of itching, we recommend combing his/her head with the ROBI COMB PRO, close to the scalp. There is no need to run the comb over the entire hair-length.